Allowing you to keep an organised kitchen at all times, our Cutlery Tray in Grey Plastic provides dedicated slots for each item of cutlery. Made from a strong and durable plastic, the tray is sized specifically to fit in most types of kitchen draw and features four concave compartments for your forks, knifes, spoons and teaspoons. 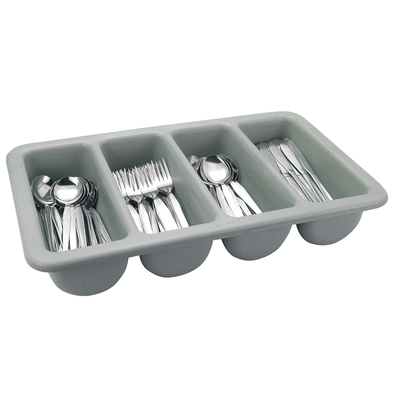 Easily wiped clean and sanitised when needed, these cutlery trays can also be displayed out during dinner time to effectively allow diners to equip themselves. When empty, the trays are fully stackable minimises the amount of space needed for storage. A durable and reliable addition to busy canteens or kitchens. Another essential in any busy kitchen is a reliable can opener and our Heavy Duty Can Opener can be mounted to the kitchen surface making it perfect for quick turnovers.